The bench press is arguably the king of exercises. It might not be as functionally important as the deadlift or the squat, but it is still in the top five of the best compound exercises. It’s the exercise that everyone knows and that all newbies automatically gravitate to when entering a gym for the first time. Despite important details and mechanics behind it that increase or decrease it’s effectiveness, it’s a fairly simple movement; You lay down on your back and simply push the weight up with your chest. It also makes your chest and triceps bigger which are far more noticeable in the mirror than building up a larger back with say, the deadlift. So as you can imagine, the bench press is almost always a firm staple in most trainees workout routines. When people start purchasing equipment for a home gym, a good, solid bench is often the first thing on the list. Followed by a barbell, some plates and then maybe a pull-up/chin-up bar. And so on. As bench presses are almost ubiquitous in most home gyms, there are plenty of options when it comes to buying one. This is a good thing as well as a bad thing. Its always nice to have options and choice; so you can find something that fits your needs exactly. The only problem with increased products and choices is that inevitably that means that there’ll be a lot of shoddy equipment available too. You often won’t know what’s good and what’s bad until you’ve got it, which can make it a nightmare when shopping. If you pardon the pun, we’ve done all the heavy lifting for you so you can pick between the five bench presses below and know that we’ve only chosen the absolute best that your hard-earned money can buy. Simply peruse our list and choose the bench press that best suits your individual needs. Even if you’re only shopping for a bench press, it’s nice to have a bench that has added capabilities and options with it, especially when building up a home gym with somewhat limited space. For example, this bench from Body Champ features a fully functional preacher curl station, a leg develop and even an ab crunch handle all built-in into one piece of equipment. The preacher curl station will come in handily especially. This bench is compatible with most 6 foot and 7 foot long bars, though if you have a barbell that’s shorter than 6 feet you can cross-check between products to see if it’s compatible. The backrest of the bench can be positioned in 7 different positions so you can perform bench presses at different inclines and declines. This is a particularly strong and sturdy weight bench that can support added weights of up to 600 pounds of weight. There aren’t many people who can bench close to 600 pounds so this means that the bench can handle more weight than most people will ever need. Marcy use 2 inch thick, dense foam padding on the backrest to ensure that you’re nice and comfortable when attempting those tough personal bests. Marcy also claim that this foam padding allows the body to reduce muscle fatigue during workouts. The backrest can be adjusted into five different positions quickly and easily, especially important if you want to superset incline and decline bench presses for example. The seat can even be set upright to perform military presses that primarily work the shoulders. If space is an issue, you might choose to go with the standard bench press from CAP Barbell. This bench press is smaller and more compact and can hold weights of up to 300 pounds, and for many lifters, this will be enough for them. Despite it’s smaller size, it’s made of durable 14 gauge, heavy duty steel and has a powder-coated finish to protect it from scratches and marks, etc. 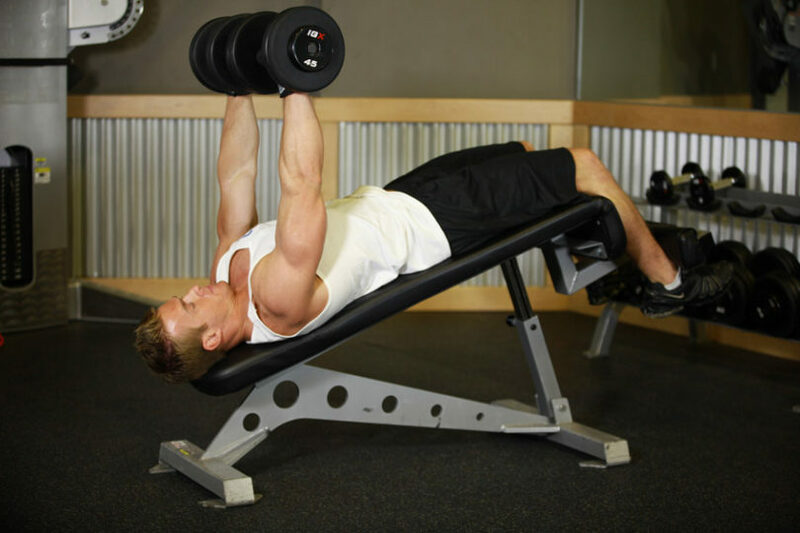 The bench can be adjusted so you can perform both flat bench press and incline bench presses comfortable and safely. This is also the perfect bench press to get if you already have a smaller barbell with lengths of between 5 and 6 feet, or even less. It also has a built-in leg development feature that targets your hamstrings, quadriceps and glute muscles. With most weightlifting benches, you have to purchase weight plates, dumbbells and barbells separately. If you would rather purchase a bench press, have it come with weights, a bar and be ready to go then go with the Goplus standard weight-lifting bench. This is another smaller and more compact bench like the CAP Barbell bench but this comes with a barbell, 2 x 8kg plates and 2 x 10kg plates so you can unpack it, set it up and get working out immediately. If you already have a barbell and your own plates then make sure that you cross-check them to make sure the dimensions fit together and that they won’t go over the 150 pound weight limit that this bench has. If you’re brand new to lifting, have limited space or just would like an all-inclusive set to get started than this is bench press will be a great investment. This is another excellent bench press from Body Champ. They’re both very similar except this one is cheaper and doesn’t have a preacher curl station. Preacher curl stations are great to have, but if you’re not at all bothered about having one and would like to save yourself some money, go with the BCB3780 instead. You can expect the same expert construction with a heavy-duty robust frame that can withstand great weights and workout punishment. The backrest/bench itself can be adjusted into different positions to target different parts of your chest and shoulders quickly and with ease. It also features a locking safety hook to stop weights from slipping off and falling on you, which is especially important in home gyms as it’s likely that you’ll often be working out alone/without a spotter. You could argue that the bench press station is the centre piece to most gyms, commercial and home. It’s a great starting purchase that you can then build up around and decide which select pieces you need to get everything you want out of your training sessions.